Home · Property Management · Landlord Quick Tips : To Renovate or Not? Every landlord knows that maintaining a rental property is hard work. Between making sure tenants are happy to constantly keeping up with maintenance requests, finding the time to successfully plan and execute renovations can be challenging. Before starting a renovation, here are a few suggestions to make sure that your project is completed in a safe and timely manner. Before starting your renovation project, it’s important to understand the difference between your property needing a renovation, or just routine repairs and maintenance. Legally, a landlord is required to complete repairs as soon as possible and maintenance should be scheduled ahead of time for the convenience of the tenant. Keep in mind, all maintenance should follow any agreements established in the lease. Unlike routine maintenance, renovations can take long periods of time and are often more successful when the property is unoccupied. One strategy for completing property renovations is to start the upgrading process during a planned vacancy. Scheduling renovations when the property is empty prevents any chance of violating the current tenant’s lease, as well as having to hire contractors that work around the tenant’s schedule. This also prevents any discussions about increasing or discounting the tenant’s current rent. All landlords know that all tenants are not created equal. While some are happy to work around your schedule and demand neither a rent discount during renovations or push back when you raise rent after an upgrade, others won’t be so pleasant to deal with. Some renovations may require additional conversations about moving the tenant’s belongings for a period of time, or giving them a schedule of when the renovation process will take place. This can hold up the completion time of the project as well as lead to other concerns. Remodeling an occupied property can be tedious and sometimes dangerous. Landlords need to keep in mind the tenant’s happiness, health, convenience, and personal property. If a tenant is upset or property is damaged, the landlord could be at risk of being required to refund the rent, pay for any damages, or replace stolen property that may exceed the price of the monthly rent. Compare the income loss during a planned vacancy to the cost of renovation and increase of rent after the project is completed to decide how to best proceed. In the long term, renovations add to your property’s value and provide justification for increased rent. Analyze the price of renovations and factor in these costs against the new price of rent. Prospective tenants are more likely to rent a property that has been recently renovated, as well as feel secure in their decision to rent a property that is well maintained. Before starting a project, research what type of renovation would add the most value to your property. What specifics need updating will ultimately determine if these renovations can be completed yourself or will require the hiring of a contractor. You will also need to check your state laws, as some prohibit non-licensed individuals from performing maintenance like electrical or plumbing. Although doing a project yourself (DIY) might save you money, there are a few potential problems at risk. It’s important to be conscious of the potential dangers that could affect your health and safety during a self-renovation project. Prior to starting your project, make sure you are equipped with necessary protective gear. If you are working with a variety of construction materials, purchase or rent protective gear like gloves or safety goggles to avoid skin irritation, splits, and the fumes from sanding, plastering, or paint. Avoid particle pollution by making sure you wear a mask and properly ventilating your workspace. Although you may take protective measures, accidents are likely to happen. At the start of your project, have a first aid kit ready for any scrapes or cuts that could happen along the way. Have an updated fire extinguisher in case of an electrical or chemical fire. Finally, if you are unsure of what steps to take next in your project, seek out professional help. In the long run, you could end up paying more money to fix renovations that are improperly completed. Hiring professional services for your renovation can be costly but ultimately necessary to complete the project. Depending on when your property was built, there could potentially be harmful and toxic substances hiding within the paint, structure, or finishing of your property. It’s important to seek professional removal services for these hazardous substances. Properties built prior to 1980 often have the presence of the commonly used material, asbestos. Asbestos containing materials (ACMs) take form in a variety of building applications. When asbestos fibers are disturbed, they become extremely dangerous. Once unknowingly inhaled or ingested, these fibers settle in the lungs, heart or abdomen and eventually leading to the development of mesothelioma. It’s important for the asbestos to be removed and disposed of by a professional abatement service before beginning or continuing a renovation project. Asbestos isn’t the only toxic substance to be cautious of. Paint dating before 1978 often contains lead and can people can develop serious health problems if it enters the body. 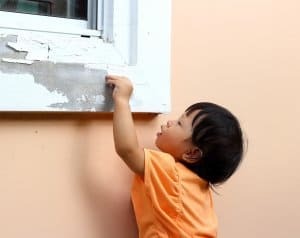 The dust from lead paint chips is poisonous to everyone but can significantly impact young children and pregnant women. Properties can be tested by a professional for lead paint, or home testing kits are also available. In addition to harmful substances like lead paint and asbestos, exposure to mold can be damaging to your health. Mold thrives in damp locations like basements and bathrooms. Professional removal services are able to assess types of mold and give you the best strategy for removal prior to starting your renovation. If you’re interested in attracting new tenants as well as raising your monthly income, look at the possibilities of a small or major renovation project. Consider minor updates like replacing light fixtures, or upgrading appliances to keep costs low but give your property the facelift that it needs. For any major renovations, factor in necessary costs that will be worth it in the long run and how they will be helpful for finding and keeping new tenants. Though you may be tempted to attempt these large updates on your own to reduce cost, the results could turn out disastrously. To keep yourself and your tenants safe and happy, weigh all options and outcome before diving into any new project.